Keyword Reporting is the most comprehensive knowledge center of SEO keyword performance. Prioritize your efforts on the most valuable keywords by gleaning the rich data sets, including search volume, ranking position, universal results, and more. Hone in on specific aspects of keyword volume and rank. Develop granular insights about keyword performance by desktop, smartphone, or tablet or by geographical relevance for over 70,000 local and global locations with HyperLocal. For each keyword uncover which page URL should be set as your preferred landing page. With trend graphs you can contextualize the performance of your content -- and your competition’s -- over weeks, months, and quarters. Track whether your brand is becoming more visible on top SERPs and in rich snippets. 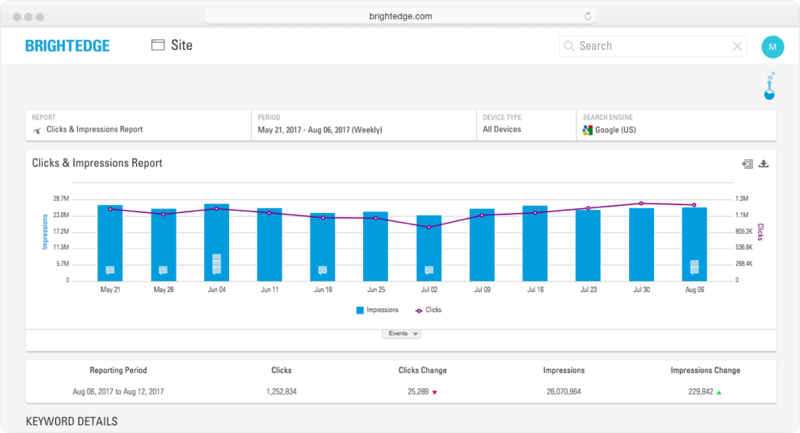 Trend impressions, clicks, estimated visits, and revenue for every topic using BrightEdge’s proprietary measures. Understand how you perform against the competition at the keyword level. Measure and track share of voice and identify key topics that you are not ranking on - but should create content for. Keyword Reporting provides insights into the how the SERP layout adapts to each keyword. Understand your potential and actual presence in Google Quick Answers, videos, or Local 3 Packs. 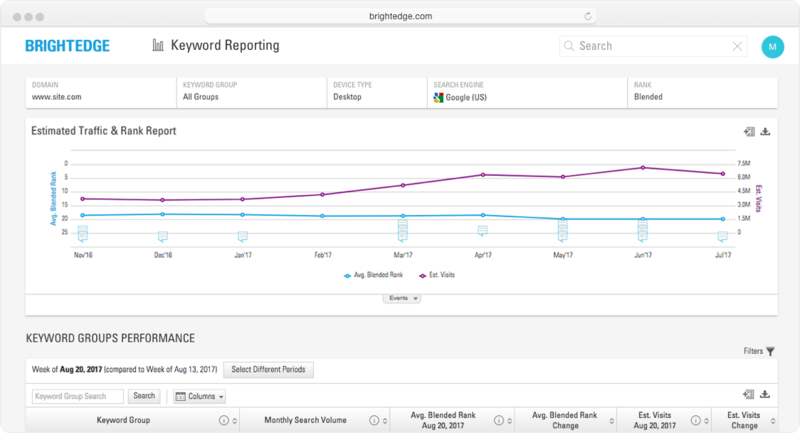 Use Intent Signal to track your content presence above the fold on SERPs and harmonize organic and paid search initiatives to maximize site traffic acquisition. 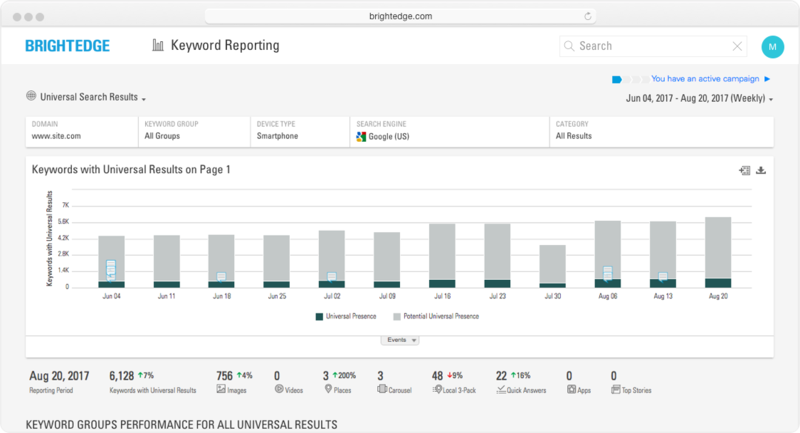 Ready to learn more about Keyword Reporting and other BrightEdge platform features? 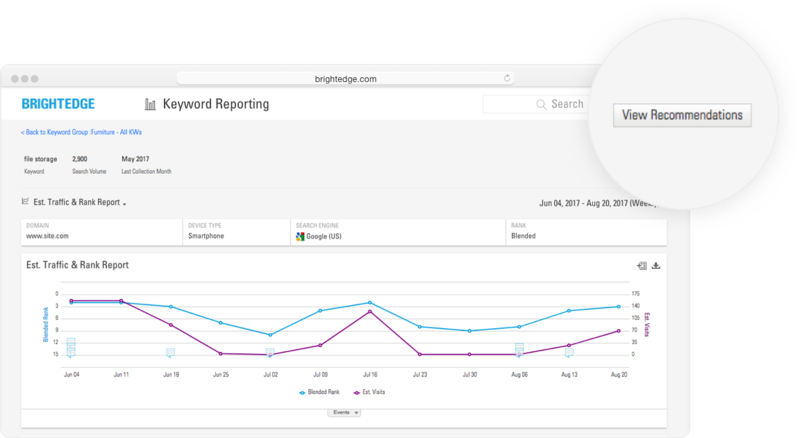 Natively integrated within the BrightEdge platform, Keyword Reporting is your launch pad for actions and analytics. Simply click on any keyword to get recommendations for the content you wish to rank for. Pull keyword data into StoryBuilder dashboards and reports to understand and communicate the impact of topic demand and content performance on the business. 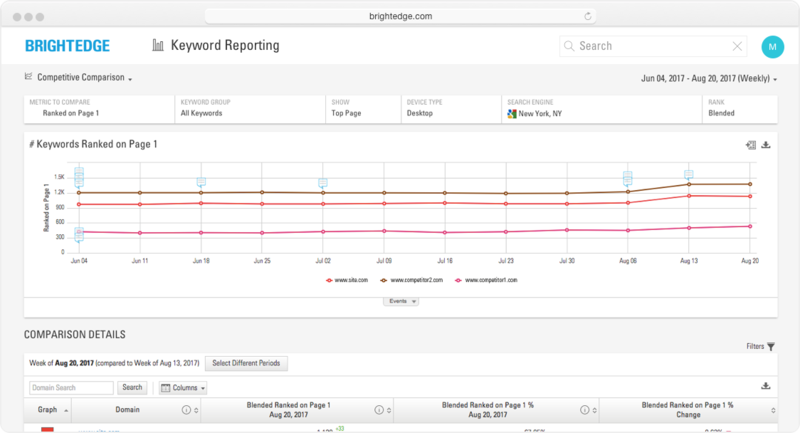 What BrightEdge enabled us to do is to really look at the keyword level -- how each keyword is performing on a monthly basis and where it’s ranking and how that feeds back into our campaign. Use Site Report to track the performance of marketing channels that drive website traffic. Identify the best-performing content pages to codify winning formulas. Page Reporting identifies the content that drives brand engagement and customer actions so you can repeat success. Over and over. Data Cube is the foundation that fuels the most successful SEO programs for global enterprises with the most complete and accurate search data. Anywhere.